Image Credit: David Linsell via The Guardian. Good news, Lovecraft fans! While it’s not a new piece of fiction, a new manuscript penned by the famous horror writer has been discovered, tucked away in a collection of magical memorabilia. The 31-page manuscript, titled “The Cancer of Superstition”, was a project requested by Harry Houdini for Lovecraft to ghostwrite shortly before the magician’s death in 1926, rallying against belief in the supernatural and superstitions—that they were an “inborn inclination” that “persists only through mental indolence of those who reject modern science.” It seems a strange thing for either of the two men to condemn, especially when the supernatural inspired so much of their professions. To be fair, there’s a debate as to whether Lovecraft wrote the entire manuscript. Speaking to The Guardian, Lovecraft scholar S.T. Joshi believes that Lovecraft simply wrote the synopsis for it, while fellow author C.M. Eddy wrote the bulk of the chapters. But even if Lovecraft only provided the outline for the piece, it’s still a pleasant surprise to discover it nearly a century later. 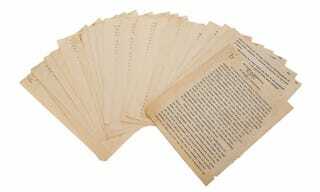 The manuscript is heading to auction in Chicago on April 9th, where it’s expected to sell for between $25,000 and $40,000.